that led to the death of Member of Parliament (MP) for Portland Eastern, Dr Lynvale Bloomfield yesterday morning. The lifeless body of Dr Bloomfield was found with several stab wounds at his home in Passley Gardens, west of the parish capital of Port Antonio, around 10:30, police said. Sources close to the probe said that bloodstains were in sections of the house, as well as in the yard, but police did not confirm that. There was no word regarding whether or not anything was taken from the house and his motor vehicles were said to be intact. Information reaching the Observer suggests that investigators believe that the person or persons who killed Dr Bloomfield were close to him. Dr Bloomfield, a Baptist, was born at Duanvale, Trelawny. He attended Cornwall College in Montego Bay, St James, and represented that school in athletics as a 100 and 200-metre sprinter before heading off to Cuba to study medicine at the University of Havana, which he also represented in athletics. He graduated in 1986 and, upon his return to Jamaica, he, among other things, ran a private medical practice in Port Antonio for over 30 years. Dr Bloomfield was elected MP in 2011 and was re-elected in 2016. 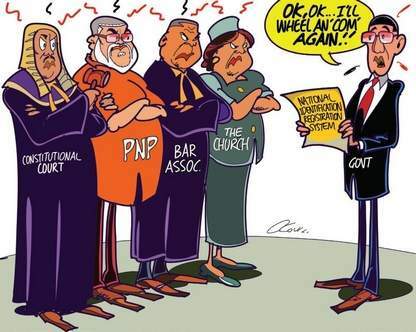 He had faced strong opposition in the defence of the seat and was expected to be replaced by the People’s National Party (PNP) for the next general election, constitutionally due in 2021. Yesterday, the Opposition PNP said in a statement that it was “shaken” by Bloomfield’s death. “No Jamaican should ever have to suffer at the hands of criminals in their own country. The death of Dr Bloomfield must not be allowed to go unpunished. The police must employ whatever resources that are necessary to conduct a full and complete investigation, and the perpetrators must be brought to justice,” the statement quoted Leader of the Opposition Dr Phillips as having said. Dr Phillips said that Dr Bloomfield devoted many years of his life in service to the Jamaican people as a medical practitioner and as an elected representative. He said that the wanton acts of criminality across the country have left too many individuals and families in mourning, and have robbed the nation of its best potential. He said this is indeed a very sad day in the history of our country as we are now dealing with the stabbing death of a sitting Member of Parliament in his home by unknown assailants. “On behalf of the entire PNP family, I extend condolence to Dr Bloomfield’s family, friends and associates,” Dr Phillips said. Prime Minister Andrew Holness paid tribute to Dr Bloomfield on Twitter, describing him as a Member of Parliament who looked out for his people.